The bridge was recorded as early as 14th February 1584. It was still wooden in 1598. A date on the bridge has been interpreted as reading “1656”, perhaps it was built in stone that year. It was referred to in “Wyndham’s Tour” of 1781. In 1804 Malkin observed “…Pont Llechryd is rendered highly picturesque by the ivy which creeps over its’ parapets…” In 1844 Pembrokeshire spent £7. 5s. on repairs to the bridge and a further £2. 10s. under the supervision of Mr. S. Davies in 1846. £30 was being spent on repairs in July 1873. 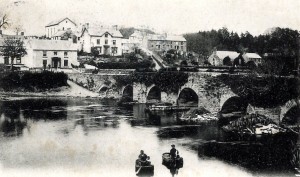 In 1875 it was claimed that the bridge dated from 1622. In 1852, £12. 7s. was spent on repairs. In 1899 it was described as “ivy-clad”. On 18th October 1907 it was proposed to raise the road by four feet, and the bridge by two. Proposed alterations had not been carried out by 11th August 1911. By 26th April 1912 the raising of the road was under way. 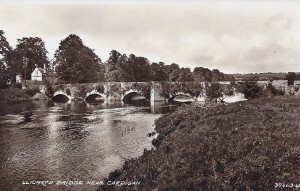 On 14th June 1919 Pembrokeshire County Council approved a £25, 000 scheme to replace the bridge. It was submerged during flooding on 11th November 1919. 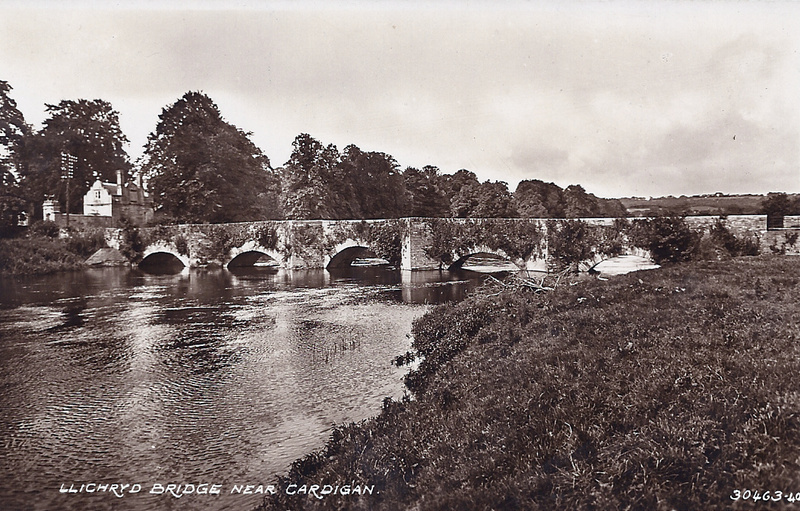 On 11th June 1920 it was proposed to replace the bridge. On 26th June 1925 there were calls for the bridge to be demolished and replaced, supported by antiquarians and Ancient Monument Commissioners, who had the structure de-Scheduled. On 7th May 1926 the Inspector of the Ministry of Transport said that the bridge would have to be demolished as it was beyond repair. In August 1929 there were further schemes afoot for building a new bridge, leaving the original standing. On 25th June 1931 tenders were accepted for building a new bridge. On 7th October 1932, following delays in the demolition of the bridge in preparation for a rebuild, it was proposed that the existing bridge should be repaired and retained instead. On 6th January 1933 repairs were again considered, though the bridge was “…almost beyond repair…” On 13th January 1933 a steel bridge was again suggested as a replacement. In an amazing statement, in view of the discussions of recent years, a report issued on 10th November 1933 stated that the bridge needed no major repairs. Trees had been removed from the sides and falling masonry repaired by that date. The bridge was registered as a Scheduled Ancient Monument on 23rd March 1934. Debates over widening the bridge continued on 16th January 1935 and January 1937. The schemes were dropped in June 1937. On 27th April 1951 and that September the bridge was undergoing repair. In September 1970 the foundations of the bridge were said to be in danger from the force of the river. In November 2000 floods damaged the parapet walls. The damage was repaired 2000-01. 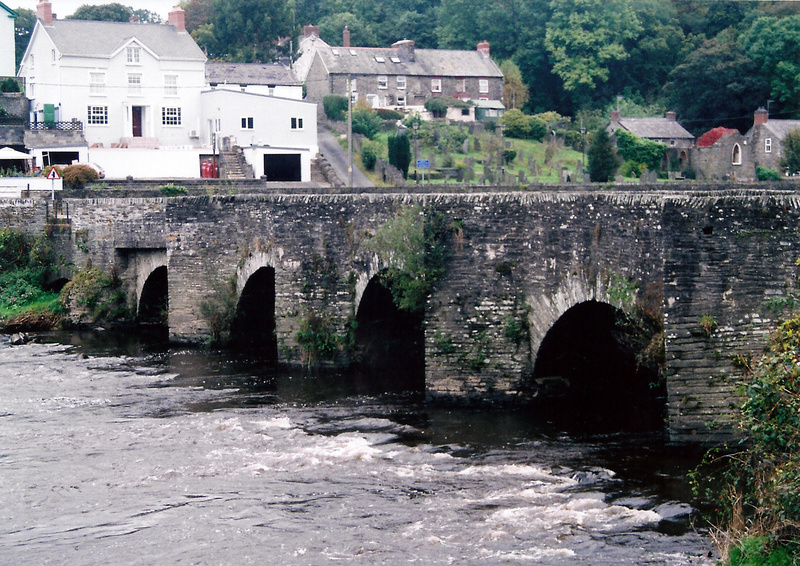 “…C17 road bridge over the Teifi. 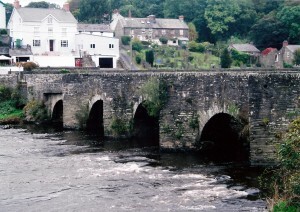 Rubble stone five-arch main bridge with cutwaters, four each side carried up as pedestrian refuges, and one at each end not carried up full-height. Rubble stone parapets. Segmental arches with roughly squared voussoirs. Bridge has further two small arches to S as flood arches, altered to one single arch on E side by early C19 widening. [Old photographs show two smaller arches to N, now concealed]. Rubble stone walls continue up to A484 with breaks for floodwater.